The first in my series of Funny!! Medical Stories belongs also in the Funny School Stories series. It happened about 1990 in a Medicine University of Romania. Yes, it's English. Scrutinize minutely. At this particular University I am talking about it was not enough this difficulty for itself. It had an added value of difficulty :) because the teacher teaching was one of the most difficult possible teachers. One of which we, from the outside world, would like to have as many as possible around, to ensure good quality of future professionals. He was totally dedicated to his teaching job, to the spirit of being a doctor – and to any good principle one can be dedicated to. His honesty was a problem for his students. They knew that it was impossible to “buy” him. No hierarchical boss, no money, no relative, no friend of him no matter how old – not even if they've shared once the same sand-box – could intercede for anybody. Trying to intercede rather endangered that particular student. He had somehow heard about his teacher being acquainted with one of the Mitropolits of Romania, living in a city 100 km away. 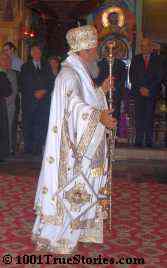 Mitropolits are a very high status in the Orthodox Church, the second right after the Patriarch which is the administrative Head of this Church. There are I think less than 10 of them in the whole Romania, anyway a country of 22 millions. Priests are generally very much respected in Romania and in all Orthodox countries: Russia, Ukraine, Bulgaria, Greece, Serbia, as well as in Moldova (actually also Romania). Nowadays Orthodoxy is again a strong faith. It was still strong even around 1990 when this story happened, having survived the long era of atheist Communism Romania had just emerged from. No wonder that Marius expected his otherwise incorruptible teacher to comply with the Mitropolit's high status. He namely somehow caught hold of the private number of his teacher. After having practiced for a while talking in an old man's voice, and using also a piece of cloth onto the telephone, he called his teacher as if he, Marius, was the Mitropolit. The day of the examinations drew closer. It was an oral examination and the Medicine students having it were divided in groups, each day another group. The teacher still remembered he had the exam with the nephew’s group on Sunday but he couldn’t remember anymore his name. He looked for the paper slip – no paper slip. Grabbed the phone – call the Mitropolit. “Sorry for disturbance, Your Holiness..., your nephew…, exam on Sunday..."
There were four young men in the group of students who had the exam on that Sunday. Everybody kept the mouth shut. Three of them because they simply didn’t know Who was it what, while the fourth one… had his reasons. All of them fell the summer exam and had to come back in autumn. They had two full months to learn. To thoroughly learn. Thoroughly indeed. TONS of barely existing entities with dimensions next to zero, ALL of them with ALL the details of their criminal records. All four of those medical students are now microbiologists.